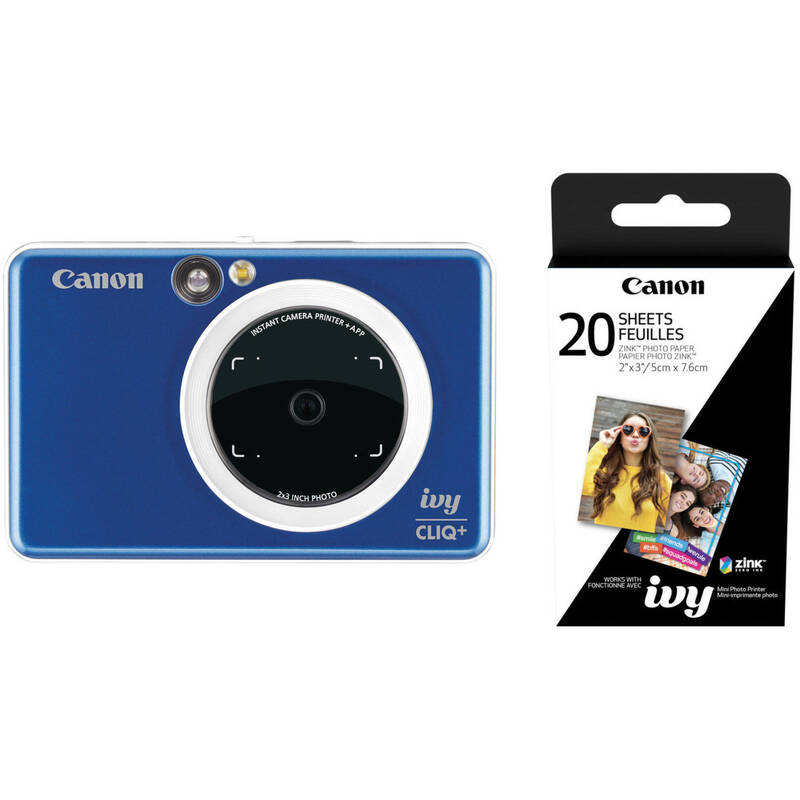 Comprising everything you need to start shooting, the sapphire blue Canon IVY CLIQ+ Instant Camera Printer with ZINK Paper Kit from B&H bundles the pocketable instant camera printer with 20 sheets of 2 x 3" ZINK photo paper. A pocketable camera and a sleek, portable printer in one, the sapphire blue Canon IVY CLIQ+ combines the fun of producing prints on the fly with the convenience of digital image capture. This compact instant camera printer utilizes ZINK technology to deliver 2 x 3" prints along with an 8MP image sensor and wide-angle lens for versatile shooting capabilities. Autofocus and auto-exposure lend true point-and-shoot functionality and the camera's design incorporates a flash for low-light situations as well as an 8 LED ring light for selfie illumination. To benefit selfie shooting, a large 2"-diameter shoot-through mirror is placed over the lens for perfectly aligning your self-portraits. The camera also incorporates an optical viewfinder, a microSD memory card slot, and has a built-in lithium-polymer battery. The IVY CLIQ+ is also characterized by its inclusion of Bluetooth for wireless control via the Canon Mini Print app for iOS and Android mobile devices. This connectivity lets you customize your prints with stickers, filters, frames, and effects, as well as remotely release the shutter or use a self-timer function. For use with ZINK-compatible equipment such as the IVY mini photo printer, these 20 sheets of 2 x 3" ZINK Photo Paper from Canon will give new life to your printer and allow you to easily create colorful prints wherever you are. They use Zero Ink printing technology, relying on different heat-sensitive layers inside the media to form the final image with no need for ink or toner. As a result, borderless printing is easily achieved, and the images are naturally resistant to smudging or water damage. The product comes configured in two packs of ten sheets, each pack with its own separate Smartsheet that can be run through the printer to optimize performance and help remove dust or debris. Prints are tear-resistant for easy handling and feature a peel-off adhesive backing for immediately sticking them onto a wall or board. A glossy finish is applied to the paper to help make vivid pictures that are eye-catching. Box Dimensions (LxWxH) 5.5 x 4.3 x 1.5"
Box Dimensions (LxWxH) 4.8 x 2.55 x 0.7"